This color atlas and manual provides clinicians with systematic, standardized, but also individualized step-by-step guidance on 3D virtual diagnosis, treatment planning, and outcome assessment in patients undergoing orthognathic surgery for maxillofacial deformities. Drawing on 20 years of experience, the authors elucidate the clinical potential of the approach while also highlighting current pitfalls and limitations. The opening two chapters discuss the 3D imaging workflow and its integration into daily clinical routine and comprehensively describe cone-beam CT virtual diagnosis. The stepwise 3D virtual planning of orthognathic surgery and transfer of the 3D virtual treatment plan to the patient in the operating room are then thoroughly explained, and the unprecedented potential of 3D virtual evaluation of treatment outcome, documented. Finally, after provision of all this essential background information, the closing chapter illustrates the application of the 3D virtual approach in different types of maxillofacial deformity. 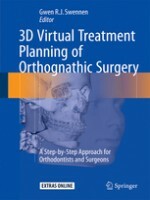 Orthodontists and orthognathic and orthofacial surgeons will find 3D Virtual Treatment Planning of Orthognathic Surgery to be a superb guide and resource.